It's busy isn't it? We are busy. Busy in the garden planting zukes and cukes, corn and lettuce. Staking tomatoes. 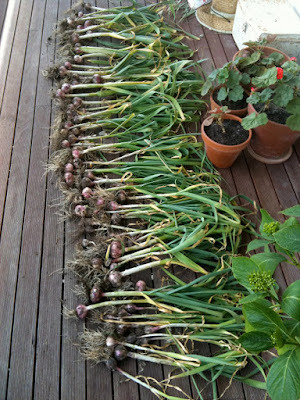 Harvesting our garlic - what a bumper crop! Busy organising Elsa's 7th birthday. Busy with end of the school year celebrations. Busy getting ready for um, Christmas. Busy getting organised for the Taste, in which I'll be baking, oh, about 500 cupcakes a day for a week. And most importantly, busy eating ice cream. There's a lot of peace to be had whilst getting to the bottom of that cone you know. but what a rewarding galric harvest! Well done. 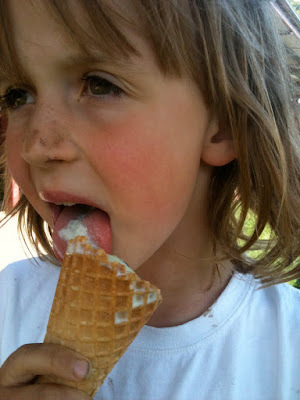 You'll definately be needing to look for those precious moments this week... in between mixing and icing. Hope it goes really smoothly for you. 500 cupcakes per day... the mind boggles. What a task ahead of you! Still there will be 500 happy people per day, so that is a nice way to start the new year. It is a busy time, isn't it. I haven't even read blogs in ages. Great garlic harvest! It is so busy this time of year even when trying hard not to buy into the whole Christmas....buy, buy, buy mantra. Looking forward to eating a few cupcakes at the taste....and one day finding out a bit more about your gluten-sugar free baking. Wishing you and your family a lovely Tassie Christmas with lots of good food, obligatory mess and family cricket matches. what a crop! ours is now hanging to dry outside the back door under the carport- I get a whiff of garlic every time- I'm hoping it doesn't infuse into our washing! Good luck at the Taste! Hope you get a chance to relax at some stage over the next few weeks!